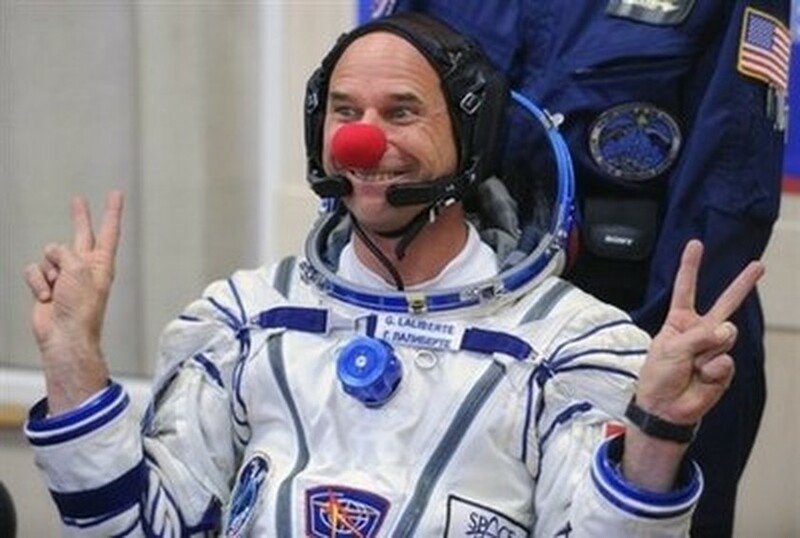 MOSCOW (AFP) – The first clown in space, Canadian circus tycoon Guy Laliberte, arrived safely back on earth Sunday touching down in a Russian Soyuz capsule in Kazakhstan, the Russian mission control centre said. The capsule, also carrying Russian cosmonaut Gennady Padalka and US astronaut Michael Barratt, landed in Kazakhstan's steppe at 0431 GMT after travelling from the International Space Station (ISS). "Everything took place normally and on time," said Vitaly Lopota, head of Energia, the state-owned company which designs the Soyuz, in remarks broadcast on Vesti-24 television. "The crew is feeling excellent," he added. Television pictures showed the capsule with its orange and white parachute touching down in the sprawling Kazakh steppe and teams of space agency workers carrying out the space travellers. Laliberte wore his trademark red clown nose as he was carried out of the Soyuz, television pictures showed. He had previously worn the nose aboard the International Space Station (ISS) and in media appearances before lift-off. The Canadian is the billionaire founder of the Cirque du Soleil and the seventh person in history to spend millions of dollars from a personal fortune to fly into space. Laliberte, who arrived at the ISS on October 2, could be the last space tourist for some time as seats will be limited aboard the Soyuz once NASA takes its long-serving shuttles out of service from 2010. The Cirque du Soleil, which Laliberte founded in 1984, fuses acrobatics with music and has made him the world's 261st richest man with a fortune of 2.5 billion dollars, according to Forbes magazine. Two days before landing, he presided over a 14-city artistic event involving Irish rock star Bono, Hollywood actress Salma Hayek, former US vice president Al Gore and others which was designed to draw attention to water conservation. The head of Space Adventures, the US-based company that organises space tourist trips, praised Laliberte's efforts. "We are tremendously proud of Guy for using his skills as a creator and artist to raise awareness for the important issue of sustainable water on Earth," Space Adventures chief executive Eric Anderson said in a statement.